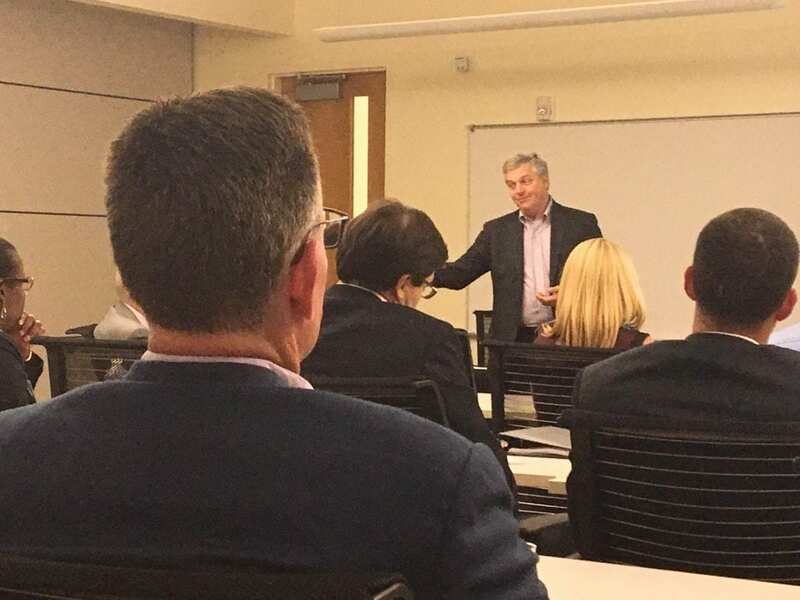 “If you don’t have a plan for your life, everything just happens to you,” said Snyder’s-Lance Executive Vice President and Chief Financial Officer Rick Puckett to students and community members at the WFU Charlotte Center on September 27, part of the School’s Leadership Series. Use a decision tree to help outline your career path. Look for roadblocks and obstacles. Consider personal development your responsibility, not your organization’s. Keep communications clear and positive. Speak up when you need to. He also urged his audience to create a personal plan, to keep work-family life balanced. During a question and answer session, students and prospective students asked him how he managed to have high quality family time as a busy executive. Puckett said for his family, it was a rule to have dinner together every night. “Sometimes I wouldn’t get home until ten o’clock at night,” Puckett admitted. “But we’d sit down around the table together and have dinner.” He joked that sometimes it was his three sons’ second or third dinner of the day, but he didn’t hear any complaints. 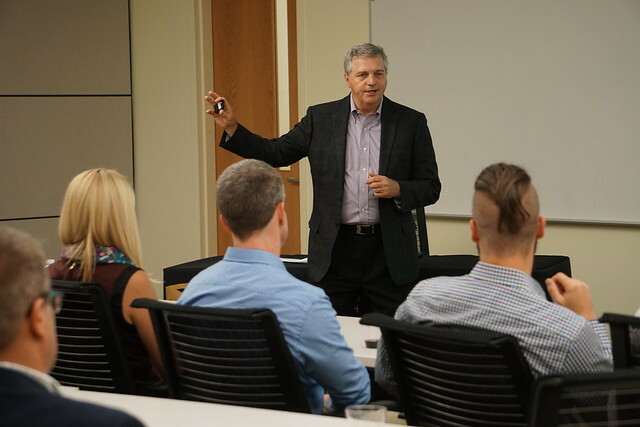 In May, Puckett announced his plan to retire from the company at the end of 2016. He plans to continue many of his volunteer interests such as serving on the Board of Trustees of the Blumenthal Performing Arts and the Board of Advisors for Wake Forest University Charlotte Center.